For the past few year's we've attended the school "fright night" disco as a Halloween night out but Lara finds it a bit overwhelming and Holly runs riot so this year we are planning a quiet family Halloween party in our own home where the girls can choose to be as spooky or silly as they want to be. As well as the Halloween arts and crafts that I shared last week, we've been stocking up on treats, decorations and costumes for our Halloween party with a spooky visit to our local Tesco. In our local Tesco there is now a bright orange welcome - vast containers of pumpkins! Holly nearly dived in! We've bought a couple of pumpkins for carving, and a couple to practice on. Large pumpkins like this probably aren't the tastiest but I'm hoping we can use the pieces that we've scraped out when carving to use in our party recipes - pumpkin cookies and an autumnal soup. 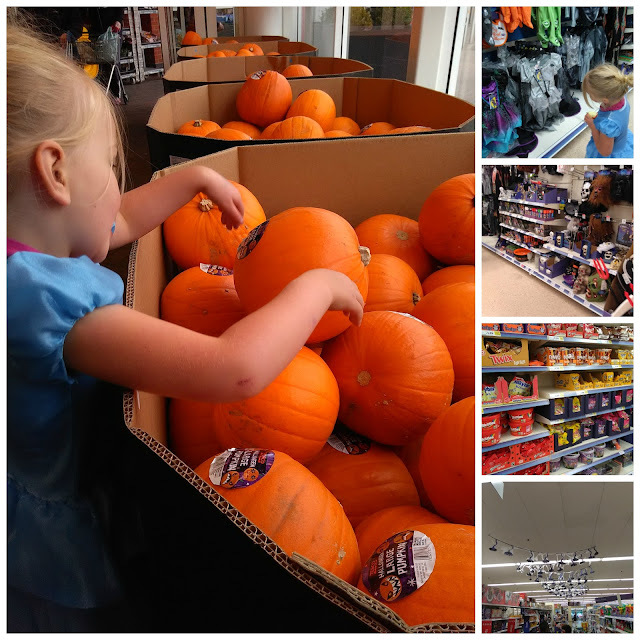 We visited the Halloween aisle in Tesco to stock up on trick or treat prizes and everything we need for a spooktacular Halloween party. A tablecloth and paper plates as basics and then some sweets and treats including chocolate-coated apples! We also bought a few decorations such as a projector torch and a pumpkin lantern to light our party and create a spooky atmosphere. The aisle was packed with bumper packs of sweets. We tend to get a lot of trick-or-treat visitors on the night so we've bought a big bucket of Halloween sweets to offer and for the girls to hunt around the house as part of our spooky party games. Look out for spooky Halloween craft ideas and recipes on the Tesco Halloween website. Disclosure: Tesco sent us a voucher to contribute towards the cost of our Halloween party.